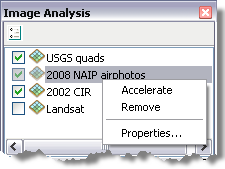 The Image Analysis window supports the analysis and exploitation of image and raster data in ArcMap with a collection of commonly used display capabilities, processes, and measurement tools. This is a window that can be docked, for example, to the side of the application's window and either pinned open or allowed to retract to a tab along the side of the application window. To open the Image Analysis window, click Windows > Image Analysis. There are five components to the interface—the layer list, Options, the Display panel, the Processing panel, and the Mensuration panel. The layer list is a reflection of all the raster layers in the active data frame, including the mosaic dataset image layer, image service, and WCS layers. A raster catalog layer is not visible nor can it be used within the Image Analysis window. The layer list does not replace the table of contents; however, it does allow you to access the layer properties dialog box and remove layers. It also allows you to accelerate the layer. An accelerated raster layer appears with this icon: . To reorder layers, you need to use the table of contents. You can select more than one layer in the layer list, allowing you to either apply processes or set the display options for all those layers at one time. For example, you can select multiple layers and change the stretch or resampling methods. Also, there is intelligence built into the Image Analysis window to control what buttons are active when a selection in the layer list is made. For example, if you select two layers, the Swipe Layer tool is deactivated because this functionality only works on one layer at a time. Or if you select multiple layers, the Composite Bands tool is activated so you can create a multiband raster layer from the selected layers. This intelligence is limited, and buttons may be active that should not be applied to the layers of data. For example, if you select two layers, the Pan-sharpening tool may be highlighted when it doesn't make sense to fuse the two images. The Image Analysis Options button is located at the top of the Image Analysis window. This opens the Image Analysis Options dialog box where you can set the defaults for some of the tools in the window, such as defining the red and near-infrared bands to be used with the NDVI tool, the azimuth and altitude values to be used with the Shaded Relief tool, and the standard deviation value to use with the standard deviation stretch method. You need to modify the options before using the tool. In most cases, these options only apply to the tools within the Image Analysis window. However, if you modify the values on the Stretch tab, such as the standard deviation value, the value is modified on the ArcMap Options dialog box (the system defaults) and affects any layers added thereafter. However, if you set a standard deviation value on the Layer Properties dialog box, it does not modify the system defaults or those used in the Image Analysis window. This Display panel contains tools used to enhance the appearance of data. These include contrast, brightness, gamma, and transparency sliders; a check box for using dynamic range adjustment (DRA); and the Swipe and Flicker tools for comparing two layers of overlapping data. The Processing panel features easy, one-click access to several commonly used image processing techniques. These include clipping, masking, orthorectification, convolution filters, and mosaicking. New layers are added to the layer list and the table of contents when using the tools in the Processing panel. This is because all the processing tools output a new temporary raster layer that uses functions to process the data. Functions allow the processing to be applied quickly and on the fly rather than creating another data file (which can take time to generate) where the process is permanently applied. To save the layer, you can export it to a new raster dataset or save the layer file. When you close ArcMap without saving, you lose this raster layer. The Mensuration panel contains tools to measure point, distance, angle, height, perimeter, and area from an image (raster dataset or mosaic dataset) with sensor information (or geodata transformation). Height can be measured along an object, its shadow, or both. You can also use a DEM to make a measurement along a surface rather than the projected surface.